Diverse and ever expanding water products for repairing, joining, restraining, tapping and capping. For gas and oilfield products that are designed for safe, consistent performance, rely on the quality of Smith-Blair. 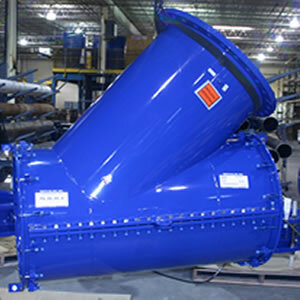 State of the art engineering and manufacturing capabilities allow custom design and fabrication. Click here for the all-new Smith-Blair catalog. If you have any questions, please contact Customer Service at 1-800-643-9705. You can view the master catalog on individual product pages on the website or by accessing it from the front page of the website under the blue heading "New Water & Industrial Catalog". For your ease of reading, click: Ctrl 0 (zero) and it will automatically go to a more readable version. From there, you can scroll down to reach individual product tables. Right click on the page and choose "Show navigation pane buttons". Choose the little blue one that looks like a book marker. This should get you to a screen that has bookmarks shown on the left hand side of your screen. Select table of contents and you'll note a small hand icon with an index finger extended which will let you choose any product. And the navigation will take you straight to the page such as the Bell-Lock 136. When you want to go to another product, click on the table of contents bookmark at leftand select the next product you need to see. In a word, trust. Our customers know we are organized to better serve the ever-changing requirements of our customers. One of our key advantages is that we are centrally located in the United States, so our response times are rapid. One reason is we maintain one of the largest inventories of premium quality products for repairing, joining, tapping, restraining and capping pipe. But frankly, we are not content with what others consider the status quo. Instead, we constantly challenge ourselves to make our business model adapt to what we know the industry needs. For instance, we recently invested in a state-of-the-art engineered fabrications department, staffed by highly experienced Smith-Blair professionals who evaluate customer needs and fabricate custom-designed solutions. It's a resource more of our customers are using daily, when "hard-to-find" product solutions delay deadlines and increase costs. So when it comes to selecting a business partner that provides quality, rapid response time and unique solutions to your complex or unconventional problems, select the company that more people trust. Select Smith-Blair. Effective February 12, 2018 Smith-Blair will initiate a list price increase of 5% on all catalog products. Click here to download the full announcement. Let the professionals at Smith-Blair assist you today. We're a call away at 800-643-9705. Or take a look at our convenient applications and selection guides for water, gas and oilfield products. They make it easier to find the right product. Either way, Smith-Blair will get you to your product faster and easier. For emergencies after normal business hours, call our emergency line at 903-277-9398.